The solution apps allow for easy and comfortable solving of various equations and systems of equations. With the Solve App individual or related equations can be easily solved. This process can as often as necessary be repeated, with the value of one or more variables in the equation changed or the equation can be solved for another variable. We look for the volume V of a right circular cylinder with a height of H = 10 m and a surface area of ​​m = 25 m, which applies to the lateral surface m and the volume V: m = 2 · π · R · H and V = R · R · π · H (R = radius and h = height of the cylinder). 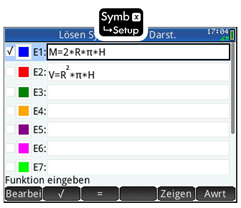 In the symbol -view the formulas for the surface and the volume can be entered and Equation 1 is activated. 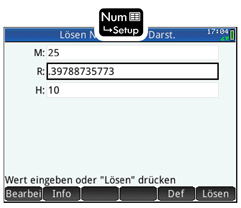 In the Num -view the given values ​​are entered, the variable R is selected and its value is calculated using the "Solve" button. After moving to the symbol -view Equation 1 is disabled and Equation 2 enabled. 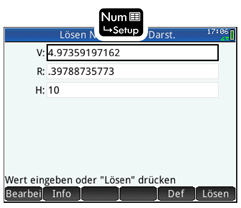 In the Num -view the height and the previously determined radius R are already available. Solving for V leads to the desired result. 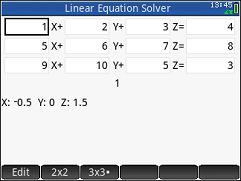 The linear solution app allows solving linear systems of equations with two equations and two unknowns and three equations and three unknowns. To do this, first determine whether it is a system of linear equations in 2 × 2 - acts or 3 × 3 form. Then the coefficients are entered accordingly. After each coefficient entry possible solutions of the linear system are simultaneously calculated and displayed. 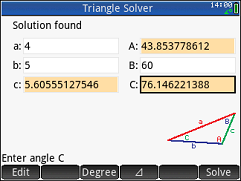 Using the triangle solver App to sizes of a triangle can be calculated (up to ambiguities), where three determining factors are given. To be selected from the six pieces of the determination of a triangle (three sides and three angles) three (for example, the sides of a = 4 and b = 5, and the angle B = 60 °) is entered, and in the triangle-solvent App. Then an unknown quantity (eg, the angle A) and selected by means of the "Solve" button calculates its value (if one exists). At the same time the remaining unknown quantities are calculated. This process can be repeated as often as necessary, with the value of one or more variables can be amended or terminated by another variable. example: There will be paid € 3,000 in a savings account with an annual interest rate of 3% compounded monthly. How much euro the account monthly (in arrears) must be bespart, to have an amount of €15.000 after 5 years (60 months)? solution: after entering the data in the Finance App is for the "WZR" changed to output the result (178.12 euro) by tapping the Solve button. 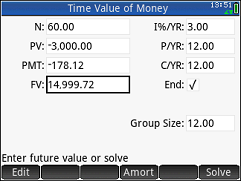 Of course, the values ​​can also be calculated and set other determinants.